This Cream of Mushroom Soup has been an entire year in the making. 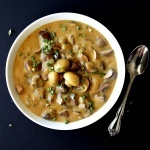 I literally began working on this blog in October of 2013 and when I was making the Green Bean and Pearl Onion Casserole (which, as you know … typically calls for cream of mushroom soup), I couldn’t find one commercially available vegan brand. Not one. I also wasn’t aware of all the wonderful non-dairy vegan options out there and thanks to my favorite SO Delicious Dairy Free Almond Milk Creamer (you could also use canned coconut milk if you can’t find it) AND vegan sour cream products (such as Tofutti, Follow Your Heart, etc.) this soup was a huge success. What’s more comforting in fall than a hot bowl of creamy soup? Ours can be also be made with the addition of more vegetables, barley, farro or wild rice and it’s a hearty, satisfying meal in and of itself. How thick you make it is up to you. I wanted replicate the consistency of canned cream of mushroom soup. In the recipe below, I’ll show you how to adjust the consistency. We began with Baby Bella Mushrooms. You could use a variety of mushrooms, but choose the most flavorful ones. White Button Mushrooms do not have alot of flavor on their own. We also mixed in those baby button mushrooms at the end which made for a nice presentation as well! 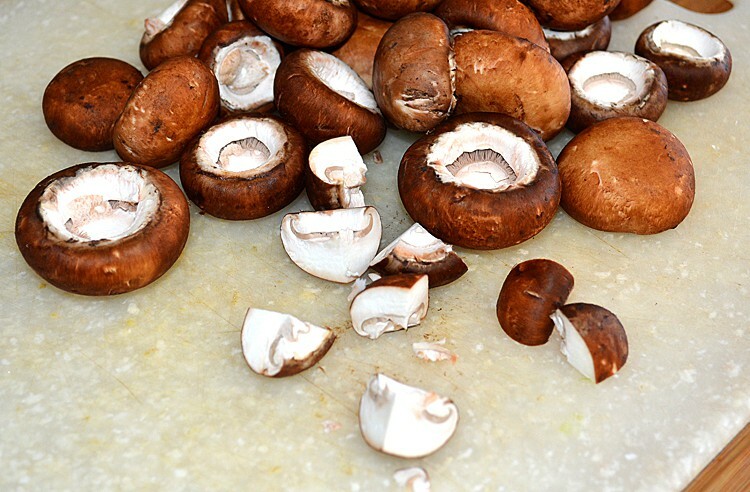 (Be sure to clean your mushrooms well either by wiping with a damp towel or VERY quickly rinsing and drying them. I prefer the latter as the dirt just seems to come off so much easier. You need to be quick because you don’t want the mushrooms to absorb the water and they are like little sponges! We want them to absorb the flavors in our soup). We sauteed onions and celery in a minimal amount of oil. 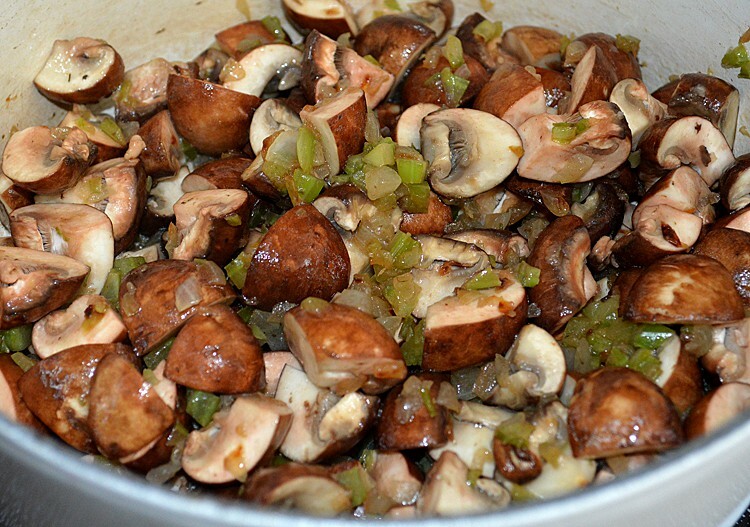 Then add the quartered mushrooms, stirring frequently and sauteeing until they start to become tender. Add the salt, pepper and dried sage at this point as well. Add a Tablespoon of flour to thicken, cooking for another minute. Next comes the vegetable broth and I always prefer low sodium so that I have control over the seasoning. You can always add to the salt in a dish, but you can’t take it away and those commercially prepared products are LOADED with sodium. Bring to a boil, cover and reduce to a simmer for 15-20 minutes. To 1/4C of SO Delicious Dairy Free Almond Milk Creamer, I added 1 Tbl of Cornstarch and mixed well. Drizzle a little at a time to your soup giving it a few minutes to determine how thick it is becoming. You may not want (or need) all of this mixture. We reserved a few of those fancy baby button mushrooms for presentation and topped with chives. Stayed tuned in a day or so for another recipe I created using this soup! Barley Farro or Wild Rice - cook to package instructions and add in at the broth stage of this recipe. In a large stock pot, add 1 Tbl of oil, the chopped onions and celery. Saute until they begin to soften. Add the cleaned Baby Bella Mushrooms. (We'll add the fancy ones later). Saute for 5-10 minutes until they begin to soften and brown. Don't go too far with this, we want them to retain their shape and have some texture. Season with salt, pepper and sage. Sprinkle the flour over the sauteed vegetables and stir until combined. Cook for 1-2 minutes to remove that raw flour taste. Reduce heat to simmer and cover. Cook for 15-20 minutes. In a small bowl, combine the cornstarch and almond creamer (or canned coconut milk). Mix thoroughly. Add to the soup SLOWLY. It will thicken quickly. I drizzle it in, stir and wait a few minutes until it gets to its full thickening power. You can always add more, but you may not need or want it all. Stir in the fancy Whole Button Mushrooms allowing to heat through for a few minutes, reserving a few for serving. Wow the best mushroom soup ever !!!!! You can conquer the world with this recipe !!! Thank you !!!! I love soup, I will definitely try your recipe. Love the added texture of the wildrice, great suggestion! mmm .. added red lentils and this thickened it right up … the red lentils also basically took on the grey mushroom colour, worked both blended and not blended! 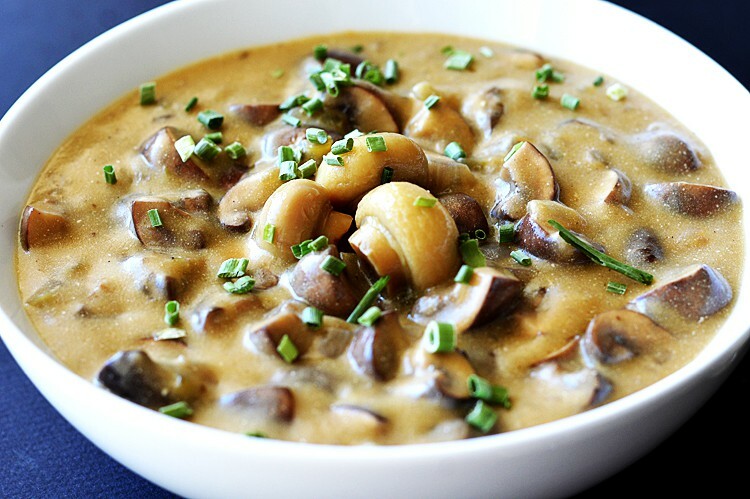 Being a vegan, I have searching for a great vegan cream of mushroom soup. Many have been good but none have knocked my socks off like this soup! It is absolutely FANTASTIC!! I will be throwing away all of my other vegan cream of mushroom soup recipes. This is the only one you will ever need!! Thank you for working so hard to perfect this! Andi, you just made my entire day! 🙂 So glad you liked the recipe. I made a delicious and very flavorful roasted veggie stock from scratch and used 3 types of mushrooms. Added a can of tomato sauce and used coconut cream. It was divine! I then pureed with a stick blender and didn’t have to use any flour to thicken at all. Served it on top of pasta. Big hit! This recipe looks so lovely! Thanks for sharing. This soup was the highlight of my thanksgiving dinner. My dad said that the whole night he was craving for more, and wanted to have leftovers for breakfast. #truestory hehe Thank you so much!! The recipe is extremely good, thank you very much. FYI: of “baby bellas” aka porcini and white button, the button have not only more flavor they have more vitamins and minerals – don’t fall prey to advertising and save a few bucks. 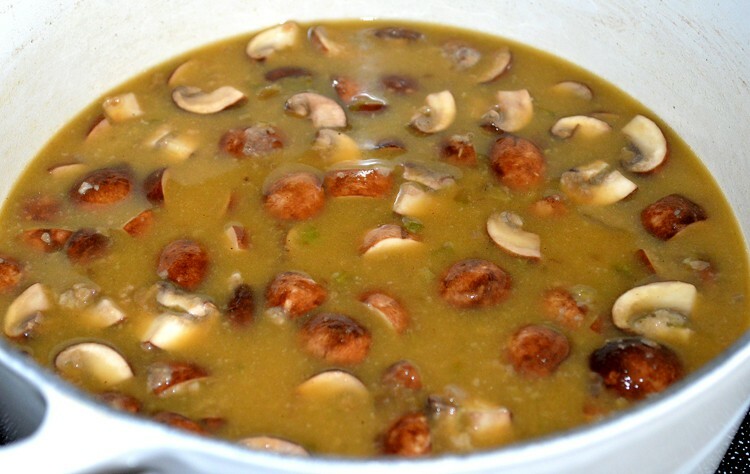 Something to try; take an 8 oz package of button mushrooms clean and place whole in a saucepan add 1/4 – 1/3 cup dry sherry and heat on the lowest setting for 20 – 25 minutes. Try them for your presentation mushrooms. I made this last night and it was FANTASTIC. I used a combination of baby bellas and shiitake mushrooms, and since I couldn’t find tofu sour cream I used a combination of tofu cream cheese and almond milk to replicate the consistency of sour cream. I also used fresh diced sage instead of dried, and added it in when I was cooking the onions. The mushroom flavor was so good, I think the mushrooms from the jar actually detracted from it. I’ll skip those next time. Hi! 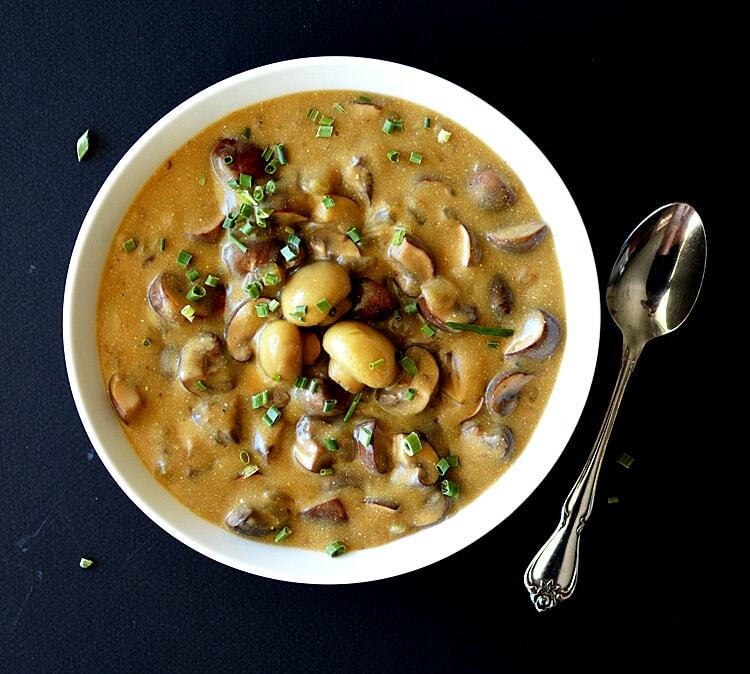 I’d love to make this delicious-looking recipe this week but I’m having a little trouble finding the jar of “fancy whole button mushrooms.” What brand did you use and where did you get it from? How many ounces is it (just in case I can’t find the particular brand you used but can find another one)? This is absolutely heaven! I have been eating plant based food for a year now and this is the first cream of mushroom soup I like! You rock! Will you this recipe for everything that calls for cream of mushroom soup.